The Bermuda Tourism Authority [BTA] is financially supporting four new live performance experiences this summer thanks to an investment programme specifically for the local entertainment industry, and the performances are underway at various locations around the island. “We received 18 applications back in May which is a testament to the volume of great talent we have in Bermuda that want to be a part of the visitor experience,” said BTA’s Chief Product & Experiences Development Officer Pat Phillip-Fairn. “The successful applicants were The Simons Brothers as well as three concession operators at the following local beaches: Horseshoe Bay, Tobacco Bay and Admiralty Cove. The total amount awarded between all successful applicants was $52,500,” the BTA said. 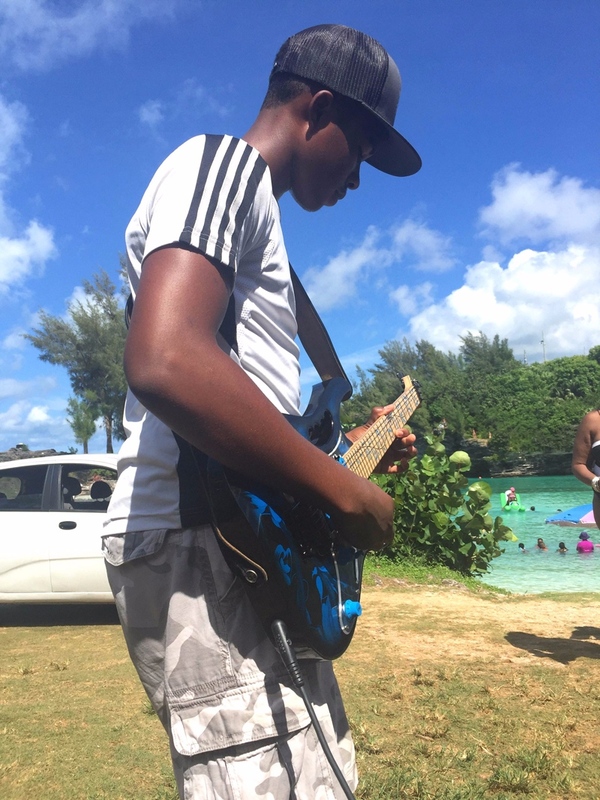 “The Simons Brothers – made up of Jonathan, 16, Solomon, 14, and Leonardo, 10 – began playing at Admiralty Cove last month, the site of a new all-inclusive adventure park which offers kayaking, zayaking, snorkeling, floats and games. 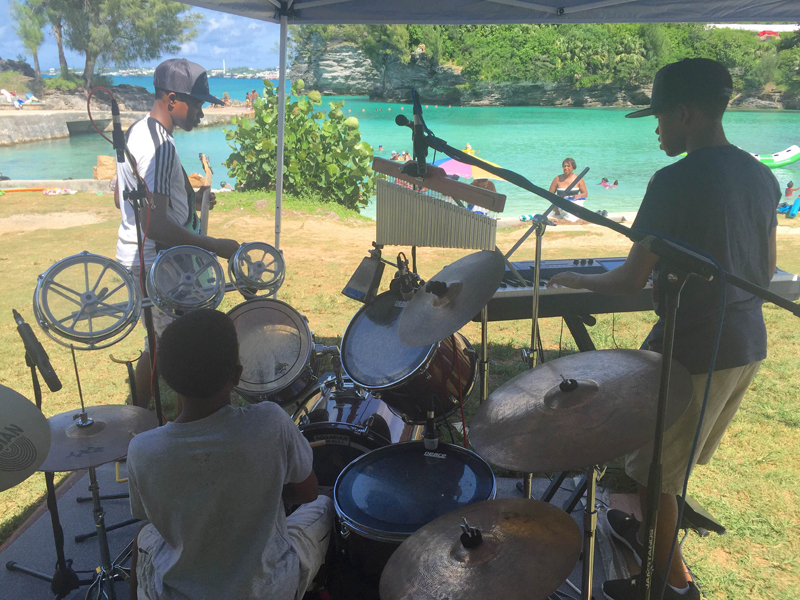 “The trio will also perform live at Horseshoe Bay and for cruise visitors at Heritage Wharf in Dockyard on Mondays, Wednesdays and occasionally on Saturdays. Mrs Phillip-Fairn said: “Supporting beach concessionaires in the way we have allows us to inspire the hiring of many local performers who can bring varied artistic experiences to these venues. “The concept of pop-up entertainment was a dominant feature among successful applicants. Consumer feedback will be measured to determine whether the concept can also work more robustly at public beaches and at other appropriate outdoor settings,” the BTA said. This is great! Tax payer dollars being put to a really great use. So true! And might I add, it’s not just the TOURISTS who want live entertainment, it’s us LOCALS too. We will be supporting these events regularly so chose your playlists accordingly. Many of us are begging for some new things to do around here. This will be great! Looking forward to it! Thank you!! A minor correction music starts at 8pm on Friday and Saturday as we are trying to be family friendly and encourage all customers to come early for our BBQ and catch the sunset from our patio and new bar area overlooking the ocean . In addition we are putting together a SUNDAY FUNDAY starting this week alternating bands and DJ’s starting late afternoon . Please join our Facebook page for more info on RUM BUM BEACH BAR …………. WE ARE BERMUDA !! Pass the hat – if these initiatives cannot pay for themselves, they should not run. They certainly should not be supported with taxpayer dollars. Would the executive at the BTA spend their own money like this? If it gets cruisers off the boat it is a win win for all involved . We only make our port tax if they don’t get off the ship every drink I sell is duty paid to our government and creates jobs which is more payroll tax Ahmed mote pension money to support our seniors . Great idea, tourist want that “island vibe” when they reach our shores, this inititiuve will give them that.